So in my personal opinion Snyder is an amazing writer and “All-Star Batman” proves it. 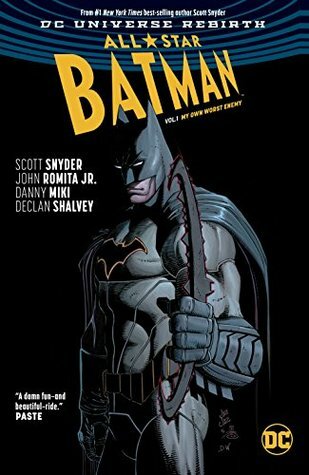 Volume 1 is OMFG good; collecting issues 1-5 you are taken on a serious battle for Batman’s life that will have you cursing at allies left and right. You can expect the bad guys to take on a bounty on Batman’s head, but other NON-baddies, well, talk about an ungrateful Gotham. I want to write soooo much more, but I only semi believe in spoilers, all I can say is that this is a must read. My only issue is with the cover, there were a few covers in issues 1-5 that I felt portrayed Batman in cooler cover, but that’s just me, I always end up thinking “oh this cover would be better”. One last tidbit, there was someone that literally had screaming “WHATTTT”, I won’t say who but just, you won’t see that coming.